PEMA CHOLING INSTITUTE is a residential Buddhist community of 100 women and girls aged 12 – 60 located in the Bumthang region of Bhutan. Many of the women arrive at Pema Choling with little or no education, from families of farmers or road laborers. The center offers basic education, vocational training and the opportunity to pursue traditional Buddhist studies at the highest academic level. Founded in 2000, the Institute contains the first shedra (Buddhist university) for women in the history of Bhutan allowing them to receive traditional education on a par with the greatest Buddhist learning centers for men in all of India and the Himalayas. The first class of 10 women is now in their 5th year of the Shedra; another 30 women have enrolled in the Shedra classes in the subsequent years. Beginning their day at 5 AM and studying or working until late into the evening, the dynamic and courageous women of Pema Choling are gaining skills and experience that will enable them to become scholars to guide future Shedra students, to become artisans, health care workers and administrators or to return to help their native communities and villages; they are setting a precedent of opportunity benefiting women throughout Bhutan. PEMA CHOLING has come into being through a confluence of events. In the 15th century, a prophesy was made by Pema Lingpa, known as the patron saint of Bhutan, that one day in the future there would be a great center of learning for women in the center of the sacred Tang Valley in Bumthang. At the end of the 20th century, Gangteng Tulku Rinpoche was traveling throughout Bhutan re-establishing the historic monasteries of his lineage that had fallen into ruin over the centuries. In the many villages he visited, he was often requested by young women that he establish a center where they, too, could study, learn, train, meditate, have all the academic and practical opportunities normally reserved only for men. Inspired by the prediction of his predecessor, the time had come. PEMA CHOLING is the actualization of Gangteng Tulku Rinpoche’s longtime vision and commitment. Rinpoche is the ninth body incarnation of Pema Lingpa, one of the five Terton Kings, who was himself the direct and only physical incarnation of the omniscient Longchenpa. 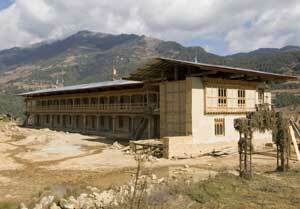 Born in 1955, Rinpoche is the Abbot of Gangtey Gompa, one of the largest Nyingma monasteries in Bhutan. He is highly revered in Bhutan and renowned as a Dzogchen master and Buddhist scholar. He also has numerous devoted students in Europe, North America and Asia. Gangteng Rinpoche is determined to give the girls and women of Bhutan knowledge, self-empowerment and the opportunity to sustain their distinct and ancient cultural heritage.